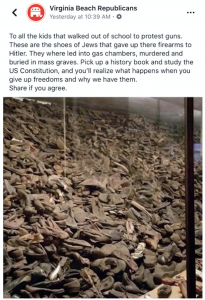 On Passover weekend, one of the most observed holy days for Jewish people celebrating the biblical end of slavery in Egypt, a Virginia Beach (VB) Republican forum made a Facebook post equating the gun control debate led by survivors of the Parkland school shooting to the holocaust – a genocide that claimed an estimated 6 million Jewish lives during WW2. 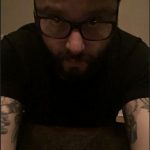 As of Sunday the post had been shared over 800 times by pro-gun advocates and has drawn widespread condemnation from the Jewish community and their allies in the Hampton Roads area, reflected in the comments section of the post. Another commentator, Oonagh Danaan condemned the appropriation of the Jewish experience during the holocaust to perpetuate “your scare tactics” and closed by observing that the Nazis gained power because of similar “propagandist tripes [sic]”. Equating stricter gun control laws to the Jewish experience during the holocaust is hardly a new strategy for Republican supporters of the Second Amendment. During the last presidential election, then-candidate Ben Carson also made a similar claim. In his book A More Perfect Union, he opined, “Through a combination of removing guns and disseminating deceitful propaganda, the Nazis were able to carry out their evil intentions with relatively little resistance.” And according to Politico, he also reiterated this point on the campaign trail multiple times. Donald Young, a Republican Congressman from Alaska, made this point in February when he said, “How many Jews were put in the ovens because they were unarmed?” Young is also a member of the NRA board. None of these claims actually hold up to basic historical scrutiny. 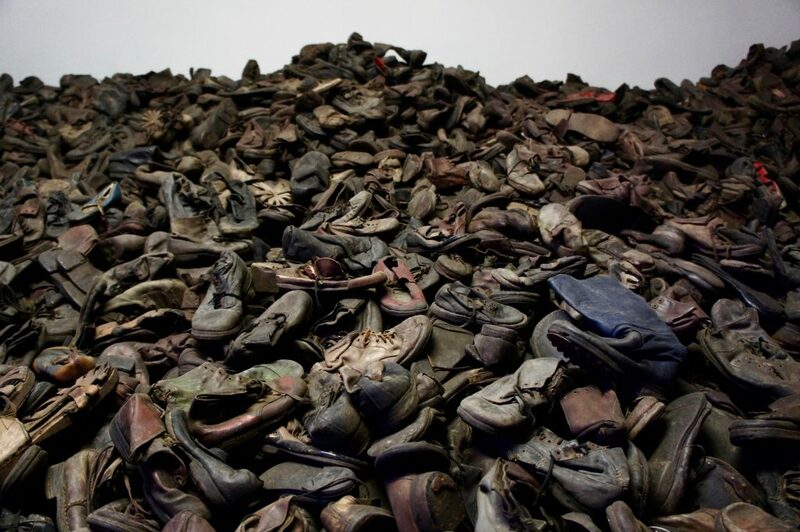 They remain more about the ideological need for pro-gun advocates to justify their intractable positions as opposed to an accurate assessment of the conditions that led to the holocaust in Nazi Germany. Despite the misleading claims, the majority of Jews who died in the holocaust were not German citizens, but citizens of the countries the Nazis invaded and occupied. The most basic historical understanding of WW2 would point to the fact that if the armies of those countries could not protect their own citizenry their Jewish minority stood little chance of escaping Nazi terrors – armed or not. 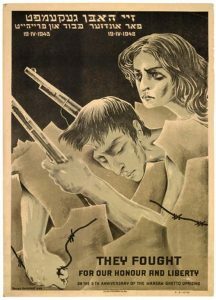 None of which takes into account that Jewish partisans, including those who rebelled in the Warsaw Ghetto, fought fiercely against Nazi aggression throughout the war years (using guns) and this still did not end the industrial genocide of European Jewry. After this inquiry, they informed RV Mag that they updated their Facebook page to reflect this statement. While the Virginia Beach Republicans FB page is not the official page of the Republican Party in VB, the messaging tactic of some elements of the conservative base have fully adopted this messaging narrative. So much so that the Anti-Defamation League as far back as in 2013 had this to say about the comparison in a press release, “Concerned over the proliferation of remarks comparing gun control legislation in the United States to policies upheld by Nazi Germany during the Holocaust, the Anti-Defamation League (ADL) today called on critics of gun control legislation to stop using references to Hitler and the Nazis, saying they are ‘historically inaccurate and offensive,’ especially to Holocaust survivors and their families.” In the press release, they cited multiple examples of conservative Republicans using this rationale including writers from the Drudge Report, Fox News, and Judge Andrew Napolitano. Joash Schulman, a Jewish lawyer and businessman in VB who reached out to RVA Mag echoed the ADL’s concerns. Speaking about the Virginia Beach Republican’s post-Schulman said, “Not only is the post incredibly offensive and inaccurate, it’s just one example of how dangerous and deceptive the messaging tactics have become from the fringes of the Republican Party.” He finished by expressing indignation that a political party would use an image depicting the holocaust to “advance a completely irrelevant political agenda” and that it was troubling that the Republican Party is willing to give political top cover to those who would spread “falsehoods and half-truths”. *As of Sunday evening the FB page from Virginia Beach Republicans has been taken down.